Project management tools come in many shapes and flavours, and most of what I review is software designed to manage small and medium-sized projects. Primavera, on the other hand, is an enterprise-grade software solution aimed at companies with a mature approach to project management probably with a programme or portfolio management approach in hand too. But where do you start learning about a product that is huge and full of features that you might not understand, let alone want to use on your project? Ten Six, a US-based consulting firm, has designed a video training course to help people get started quickly with Primavera. When you first install the software, you’ll probably have Primavera consultants work with you to get it set up correctly and they’ll do some on-site training. But by the time the next project manager joins those consultants will be long gone so you’ll need some other way of getting new starters up to speed. This video course could be it. What you get: High quality video with sample data files and a 47-page exercise workbook. 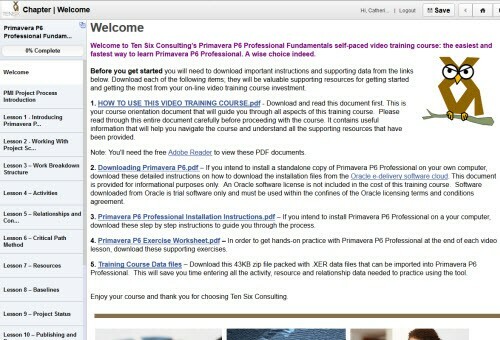 Also includes detailed instructions on how to download and install Primavera P6 if you don’t already have it. Audience: Aimed at people who have never used Primavera P6 Professional. Duration: You should be able to complete it in 2 days. Length of access: 3 months. Ten Six will grant extensions if you email them to request one. PDUs? Yes, 7 category A PDUs offered. The course starts with a 6 minute video about PMI’s process groups to set the whole thing in context. It’s actually a pretty useful summary of the project management lifecycle. The videos are fine. You don’t get a talking head trainer as they instead show you screen flows and slides to illustrate the points. This is a shame as I think it helps to ‘see’ a trainer from time to time to give you that idea of human interaction. Each lesson includes a quiz and you can refer to the workbook for exercises to do on each topic. There are 12 lessons plus 3 bonus lessons. You don’t have to take the lessons in order so you can skip around as you come across topics that you need to study right now. The lessons do build, though, so it would be helpful to start at the beginning and work forward instead of jumping straight to global project and report calendars (covered in Lesson 12). Whether you do the lessons in order or not, the learning management system will record how much of the course you have completed so you can track how much you’ve done and how much you have still to do. 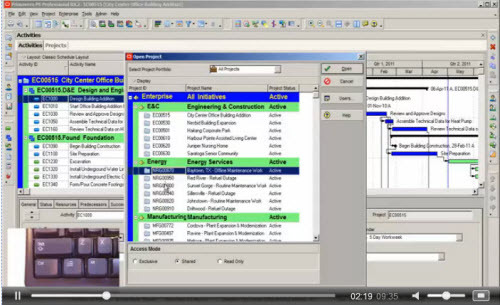 The Work Breakdown Structure video was useful, as it gave a general overview and then how that translates to the software. Some of the videos are too long in my opinion: the lesson on project reporting is 25 minutes long, which is a long time to sit and look at slides and a screen walkthrough. This could have been split somehow into two shorter videos combined with the exercises. The bonus lessons cover P6 Visualizer (useful if you are using this module), percent complete types and progressing activities using steps. These lessons don’t have quizzes. What surprised me was how old-fashioned the P6 system looks (although of course the training provider has nothing to do with this). The course is comprehensive and, while I’m not an experienced P6 user by any stretch, it looks to me as if it includes everything that you’d need to get started and build your skills in using this software. 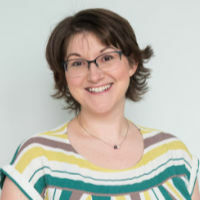 It’s easy to navigate through the training and the workbook, and I think you definitely need the workbook exercises and associated data files to really get to grips with the software – you can’t learn to use it just from looking at the videos alone. Access to the videos is removed after 3 months unless you request an extension but it looks like you can download the workbook and data files and use these for as long as you want, which would be helpful if you wanted a refresher at any point. I liked the quizzes and it helps confirm that you have picked up certain skills, especially vocabulary and navigation (which were most of the questions I got wrong). They would also be useful if you were training up a new member of staff as you could mandate certain pass marks before they move on to the next module. Overall, I think project management training is moving more towards this sort of model: online, subscription-based delivery backed up by written materials and potentially remote support and tuition (although access to a tutor isn’t offered with this course). If you want a cost-effective way to get started with Primavera P6 with the flexibility of online learning without the hassle of going to a classroom then this course will meet those needs. You can read more about it on their website here. Full disclosure: Ten Six is a client of The Otobos Group, but I’ve reviewed this product independently and honestly and have not been compensated for it.